Ages old marble, by its very nature, is the perfect medium to support brilliant new global recognition award that will honor your most brilliant performers. 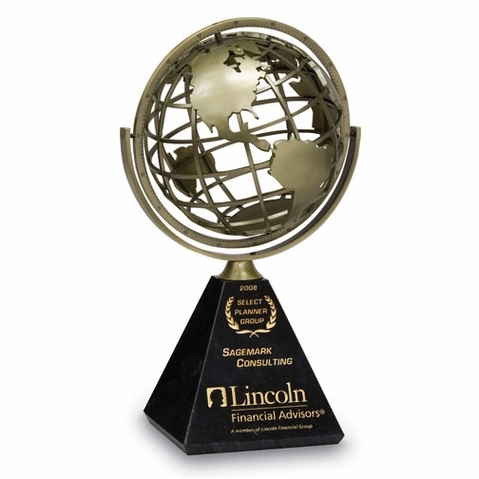 Reward uncommon worldly success with our exclusive heavy metal grid planet, with molded polymer continents in antique bronze, embedded into a precisely cut black marble pyramid decorated with Quarry�s signature deep carving and gold color-fill. The globe is an extra large 7.5� in diameter and is poetry in motion as it rotates 360� and gyrates effortlessly on its axis. Our contemporary design visually captures a depth of dimension and openness that will perpetually recognize your ultimate achievers. Presentation / Gift box included.